The root of a function is a value of its argument, at which the function is equal to zero. The root of an algebraic equation is a value of its unknown, at which the equation becomes identity. The root of a system of algebraic equations are values of its unknowns at which the equation which is included in system, we identity. One of typical tasks solved in Mathcad is a search of roots of the algebraic equations and their systems: a finding of unknown values (unknowns in the case of one equation), at which equation turns to identities. In Mathcad there is a wide tooling (commands of the menu, functions and operators) for the numerical, analytical and graphical solution of this task. 1. One root from many existing ones is determined. Which root will be found depends mainly on the first approximation to the solution (guess values). 2. No root of the equation or system is searched, and the value unknown (unknowns), at which deviation of the right and left parts of the equations (discrepancy) does not exceed the previous number given. In Mathcad, by default, it is equal 10-3 (the values of the system variable TOL and CTOL). 3. Work of functions root and Find (namely these are built-in functions in Mathcad for the solution of a header task of the article) has certain random and unpredictable characteristics, that distinguishes them from other built-in functions Mathcad. The function sin, for example, always gives out the "predicted" answer: to each element of the set "the argument of function" corresponds to the quite certain element of set "value of function". In the relation to functions root and Find, such clearness is not present: these functions can return at all that from them expect, or in general under abnormal condition to interrupt the work, having asked the user to change some parameters of search and to repeat account. The function Find, in general, is completely contextually dependent: the value, which it returns, depends not only and not how many on values of its arguments, and how near it is written. It can be considered (examined) as a certain infringement of a principle of functional dependence underlying mathematics. We shall also note features of analytical and graphical search of roots in Mathcad. By analytical search the Mathcad system tries to find all roots with absolute (analytical) accuracy. Because of it, the decision of even the elementary tasks frequently comes to an end by failure(see fig. 1). In a fig. 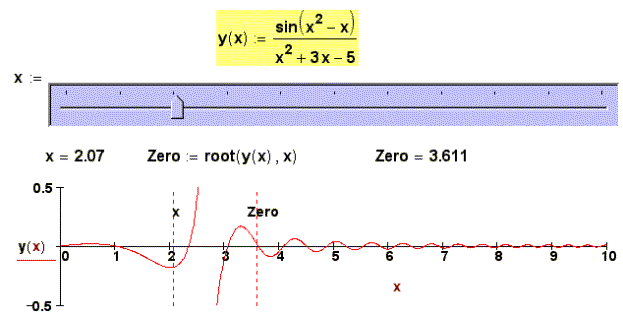 1 the analytical (symbolic) search of roots y of the equations sin(x)/x = 0 and sin(x) = 0 is shown. 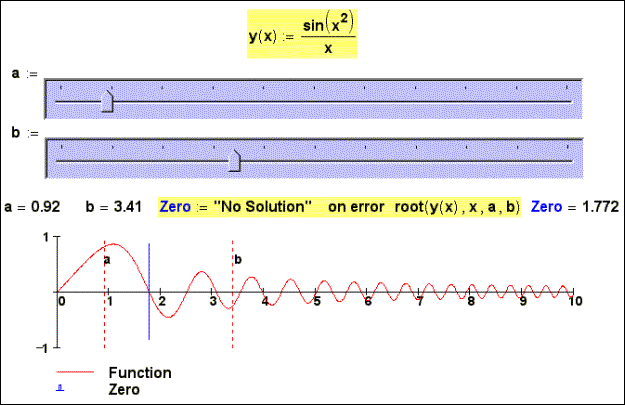 Though at these equations of roots the uncountable set, in the first case instead of a root is given out the message on a mistake "No solution was found", and at simpler second equation sin(x) = 0 symbolical mathematics Mathcad are found by (with) a unique(sole) root х = 0. The Plot of Mathcad basically is used for verification (check) of correctness of the decision and - or for specification of the data for the first approximation by numerical search of roots. In fig. 1 (and fig. 2, seen lower) the plot of function sin(x)/x, for example, is shown on a piece -10, 10 six times (the fig. 1) crosses an axis x, but on which symbolical mathematics Mathcad, nevertheless, has "broken". The Mathcad built-in function root searches a root of the equation by numerical methods. Since Mathcad 2000, the function root can have not only two arguments (the combination of methods of Newton and secant), but also four arguments (method of haft division). In this case a root is searched not near to a point of initial approximation (the variant of function root with two argument), but in an interval of values of the unknown, set by two additional arguments. The work of function root with the equation sin(x)/x = 0 is shown in fig. 2. But in the article the Plots of Mathcad will be involved not in absolutely usual aspect – for visualization of functions returning roots of the equations and systems and having as arguments the values of the first approximation (guess values). New opportunities not only for the analysis of those or other numerical methods realized in Mathcad, but also for … of art creativity here open. In a fig. 3 and the fig. 4 is shown, what roots of the equation sin(x)/x = 0 returns the function root depending on values of the first approximation. The diagram in a fig. 3 is certain the "portrait" of a method of Newton-secant, which essence is those. Through two points (one of which is first approximation, and second recedes to the right from new on distance TOL) will be carried out secant, which crossing with an axis x gives a point of the second approximation. But previous values of the function in a point of the first approximation are checked, that early: if it is less TOL, the task is considered solved. If there is no – an iteration proceed: secants will be carried out through new pairs points. Only at the first approximation will be carried out, not secant, and actually tangent (method of Newton). From here we get to the clear diagram in fig. 3: when the value х on the module does not exceed the value of system variable TOL (10-3), the root is for one iteration (see the middle of fig. 3), and if it exceeds, behind some iterations. Thus to foresee which root will be found, it is rather difficult: the value of roots have scattered in a wide range (see left and right edge(territory) of fig. 3). For search of a root of the equation it is possible to use also function Find, writing down before it not system, but single equation (fig. 3a). In this case (fig. 3a) the character of points of the first approximation near to critical points will be quite predicted: the function Find is based not various updating gradient methods (see below) – decision "rolled up" either to the left, or to the right. One is a bad – function Find works on the order more slowly than the function root. The function root, returning a root of the equation sin(x)/x = 0 by method of haft division, as remarked earlier, has not one, and two arguments. Hence, its visualization requires any more line (fig. 3 and fig. 3а), but a surface (fig. 4). Besides at the formation of the function Rt the operator of processing of mistakes was used: when the function root can not give out a root, the function Rt returns the number 23 (number, it is more than 7 π – maximal root on a the surface a-b). This number in a fig. 4 is "painted" in white colour, the roots have "topographical" colouring: small values of roots (-7 π) – dark blue colour (depth of ocean), and large (7 π) – brown (top of mountains). The intermediate roots are "painted" in intermediate colours (light-blue, green, yellow). All this is together similar to a mosaic marble floor or picture in style of cubism. For the numerical decision of systems of the algebraic equations as already was marked above, the function Find, working in pair with a keyword Given is intended built-in in Mathcad. In a fig. 5 the work of function Find under the decision of system of two nonlinear algebraic equations is shown: the function Find returns this or that root depending on values of the first approximation. It is also shown that at "unsuccessful" first approximation (in a fig. 5 it, for example, beginning of coordinates) the work of function Find interrupts by the message on a mistake and appeal to the user to change parameters of search: the first approximation, values the system variable TOL and/or CTOL. If the first approximation includes complex numbers, the function Find can return a complex (imaginary) root – see fig. 5a, where our system is written down in a vector kind, when the unknown systems are not separate scalar variable (x, y, z etc), and elements of a vector x (x0, x1, x2 etc). But we shall return to four real roots of the system. In a fig. 6 surfaces x-y is painted in four colours depending on what root from four existing (see fig. 5) was found at the first approximation taken in the given "colour" area. «Blank spots» in a fig. 6 (and fig. 7a and fig. 7b too) are areas, the search of roots from which was interrupted by the error-message. When the author has shown fig. 6 to man knowledgeable in fine art, he was told, that it was … «Landscape at Auveres after the rain» by Vincent Van Gogh. The truth, this "artman" had not time (was in time) put on glasses, and fig. 6was shown to him have issued. But at more detailed comparison the similarity of colour scale and "invoices" (strip ridge, range) figures was marked. Whether or not it is so, we will let our readers will decide for themselves, having compared fig. 6 and fig. 7. But we shall leave in the party «the aesthetic party» a fig. 6 and fig. 4 and we shall talk about practical businesses. In Mathcad three methods of the solution of systems of algebraic equations are realized: the method Levenberg-Marquardt, the method of the Conjugate Gradient, and methods of Quasi-Newton – see fig. 6a, where the local menu appears after pressing of the right button of the mouse on the word Find). So, the fig. 6 is "portrait" of the first method (it was chosen by system Mathcad automatically for the decision of our system by package Mathcad – see position AutoSelect in a fig. 6a), and the fig. 7a and fig. 7b is "illustrations" of two other methods: Conjugate Gradient (fig 7a) and Quasi-Newton (fig. 7b). It is simple to estimate the relative area white patches in a fig. 6,fig. 7a and fig. 7b and to give a certain quantitative estimation of methods of the decision of systems of the nonlinear algebraic equations realized in Mathcad. Here is how, for example, will look a fig. 6 if to raise(increase) accuracy of accounts - to change values of system variable TOL and CTOL from 10-3 (default) on 10-15 (fig. 6b). And figures (fig. 6, fig. 7a and fig. 7b) make certain triptych (three "picturesque" cloths incorporated by one theme), which can be used not only for an estimation of quality of those or other methods of search of roots, but also for … of aesthetic pleasure. The author offers to the readers to pick up other equations of system with other "picture" of roots. In "picture” in a fig. 6 "beauty" has introduced lemniscate («twine by colours») Bernoulli. But in mathematics still there are many other "beautiful" curves, which can transfer "beauty" to figures similar to a volume, to what is shown in a fig. 6. More correctly to speak not about a root of function, and about zero of function. But … see the article. Systems of the linear algebraic equations is the special theme, with which in this article we shall not concern. Let's note only that the linear equations and systems is a special case of nonlinearity: the linear task is quite possible for deciding solving by «nonlinear» tools, though it, to tell the truth, «chocking of nails by microscope ». In Mathcad there are special tools for the solution of systems of the linear equations which have been written down in the matrix form (function lsolve, for example). In Mathcad up to the eighth version there was one system variable TOL (TOLerance, condescension to an error). Then this variable has broken up on two TOL and СTOL. Now TOL "answers" for work of functions root, Find, Minimize, Maximize and MinErr, and CTOL - for restrictions (Constrains). The nucleus of symbolical mathematics from a package Maple is built in Mathcad. We are "selected" to second half of name of clause.